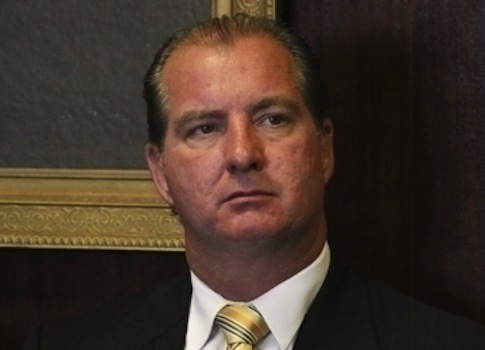 Charles Moreau, a Democrat who resigned Wednesday from his post of mayor of Central Falls, Rhode Island, is pleading guilty to federal fraud charges for having channeled city jobs to his friend and political contributor, Michael Bouthillette. The city faced foreclosures on numerous homes, and the mayor fast-tracked the job of boarding up the houses to his ally, often bypassing typical protocol. According to prosecutors, Bouthillette boarded up at least 167 homes from September 2007 to July 2009. He made "unreasonable profits amounting to hundreds of thousands of dollars," the criminal charging document said. Moreau allegedly circumvented competitive bidding requirements by declaring homes to be emergencies needing immediate board-ups. In some cases, tenants were still living in the houses, and in other cases Bouthillette re-boarded houses that had already been closed up by owners, prosecutors said. In return, prosecutors said, the mayor took kickbacks—partial payment of a furnace for his Central Falls house and renovations and flood remediation to another home. The city declared bankruptcy in 2011 because of a worsening fiscal crisis due to decreasing state aid and unfunded liabilities. The city, with a population of 19,379 in July 2011 and land area of 1.29 square miles, also had nearly 400 house foreclosures since 2008. A receiver assumed the mayor’s power in July before putting the city into bankruptcy. Prosecutors will recommend that both men serve prison time. The motto of Central Falls is "A City with a Bright Future." This entry was posted in Politics and tagged Crime Blotter, Fraud, Rhode Island. Bookmark the permalink.